Pickup at hotels in immediate San Jose area. Additional charge for hotels outside of immediate San Jose area. Climb aboard a bus during morning pickup at your San Jose hotel, storing a change of dry clothes and other items you may need during the day above your seat. After picking up any other fellow travelers, enjoy the scenery while passing through yucca and papaya fields en route to the put-in spot on the Sarapiqui River. Get a safety orientation and instruction on paddling and commands from your river guide, and then gear up with a provided raft, paddle, safety vest, and helmet before launching onto the currents. 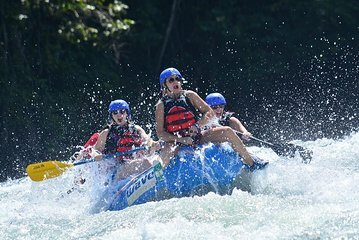 During the 2-hour voyage downriver, navigate class III and IV whitewater rapids with names like ‘Dredges’ and ‘Magnetic Rock.’ Soak up the lush rain forest scenery during calmer stretches, and keep an eye out for native wildlife such as sloths, monkeys, and toucans. Take a break to swim in river pools and replenish your energy with a snack of fresh tropical fruit and cold drinks. Once you have conquered the Sarapiqui, change into dry clothes and head to a traditional country estate for a taste of Costa Rica’s pura vida lifestyle. Enjoy a delicious lunch of simple but fresh cuisine here before completing the bus journey to Arenal/La Fortuna, where you will be dropped off at your accommodations in the late afternoon just in time for check-in.